It is copyright © Chad Scheel and Jacket magazine 2010. See our [»»] Copyright notice. 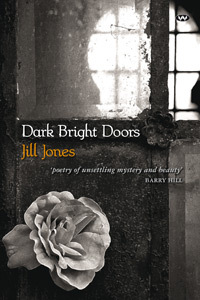 The publisher’s comment to Dark Bright Doors describes Jones’ work as “self-critical and very present.” The self, as it locates itself within Jones’ work, is not one which strives to be in the present — because it wants to be — not zen striving — but because it feels obligated to be. The poetic self which stabilizes within a grasp of objects in the material world is here transformed to one which loses grip on those objects and all personal connections. The book’s enscription states “Contact/is/the art” and each poem reaches toward that contact. Some fail (intentionally — these are brilliant poems) and others begin to make their way toward a resolution in that which is beyond the poet. as a self that lacks the necessary tools. From the beginning, the book makes use of vacancies as an barrier. Through various forms and modes, Jones attempts to fill those spaces — sometimes by revising a different self, sometimes by giving up entirely. In “At Large,” Jones writes: “but now, bypass the knife/the gate, bypass yourself”. The concern that typically arises for a poem that places itself within such a current locale is that it stale dates itself. (I wonder — with Armantrout’s reference to Powter — will later generations be able to read that poem the way the current generations read Zukofsky?) Rather than run this risk, Jones buries these notes so that the poem might function without the culture context. References to tiger [Woods], Bob Dylan (“blond on blonde”) and even Princess Leia occur, with only the last being capitalized and allowed to stand out. In this sense, the allusions are part of the landscape. In “Mystery Train,” Jones sees “riding round all night/everyone looks like Elvis”. However, like Armantrout, Jones turns to these allusions when the self is defining itself as something larger, culture or society as a whole. Jones’ finer — or at least more stable — moments occur in poems where the specifics of location replace the philosophical materials of her longer poems. Armantrout, Rae. Versed. Wesleyan University Press, 2009. 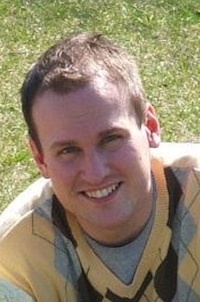 Chad Scheel lives in Scottsbluff, NE with his wife and son. His poems have appeared or are forthcoming in freefall, Poetry East, elimae, Arch, and Anemone, Sidecar, and Indefinite Space.